After three windy, rainy, bone-chilling days, autumn is back. The sun is strong but the air is crisp. My favorite weather. I took Wizard out on the trails in hand and Mary the Morgan and her owner rode with us. We were out for about 30 minutes and it was lovely. It was almost dark when we left and totally dark when we returned but both horses were very good. I rode Selena for about 40 minutes. She was obedient but was not as loose in her topline as she has been in recent rides. She is going through a heat cycle so I think she will be back to her limber self in a few days. We warmed up at a walk, doing shallow serpentines and walking over four poles. As the ride progressed, Selena became more comfortable and her transitions improved. We did more work on a forward trot and back to a working trot. I also asked her to do a slow trot and she responded well. Her best work of the night was when we did a little shoulder-in at the walk- it was her best effort to date. Because I did not get her to completely loosen up her neck and topline, her canter-trot trantions were not quite as soft as they were in our last ride, but they were more accurate. After our ride, I cooled her out and we played with the pedestal. She learned to step up onto it in about 15 minutes, the same as Wizard. Her athleticism made it easy once she figured out what to do. After eating his evening alfalfa, I free longed Wizard at a walk, trot, and canter in both directions and did a little more work on the pedestal. Last night, he sniffed the pedestal and gave a flehmen response and I clicked and gave him a treat. 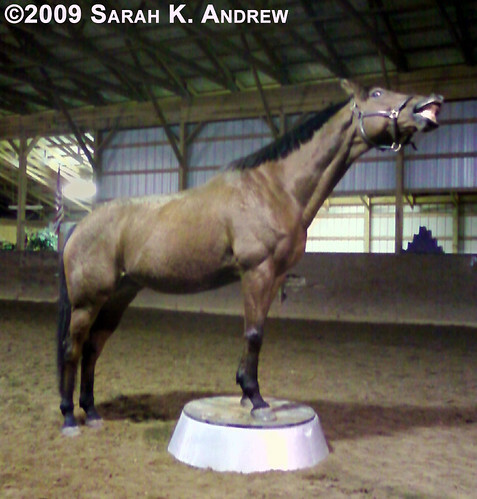 He repeated the behavior tonight and we turned it into a new trick :^) Once he was on the pedestal, he smiled (see photo above). Now he is a two-trick pony! Hahah, that’s a seriously awesome clicker trick. Love it!